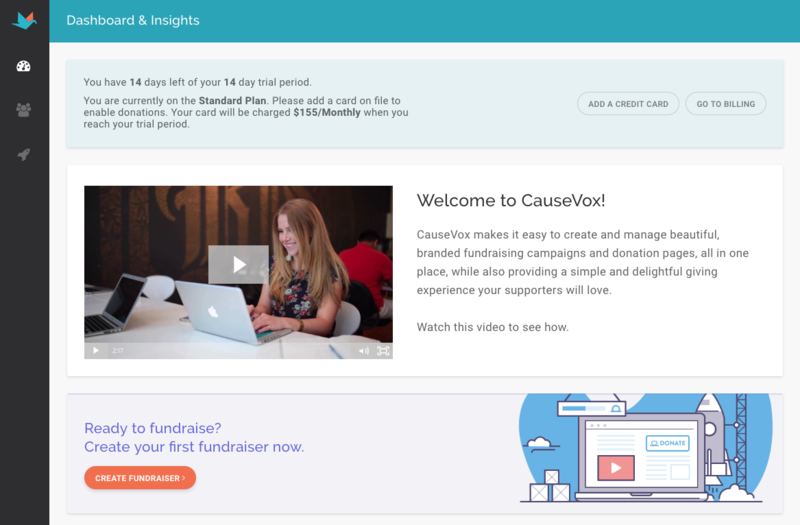 In this guide, you’ll learn how to create a CauseVox Admin account, customize your campaign site, and get it setup to take donations. This is a quick overview guide. 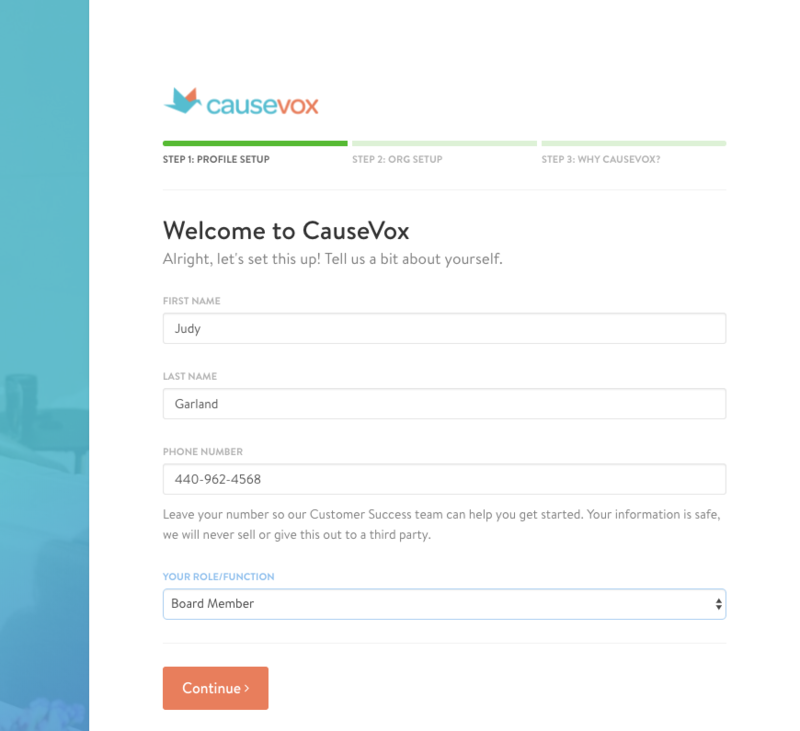 Step 1: Register for a CauseVox Admin account on http://admin.causevox.com, with your email and password. Note: Your password must be 6 characters long. Step 2: Complete your organization information. You'll want to write your name, phone number, and role at the organization. 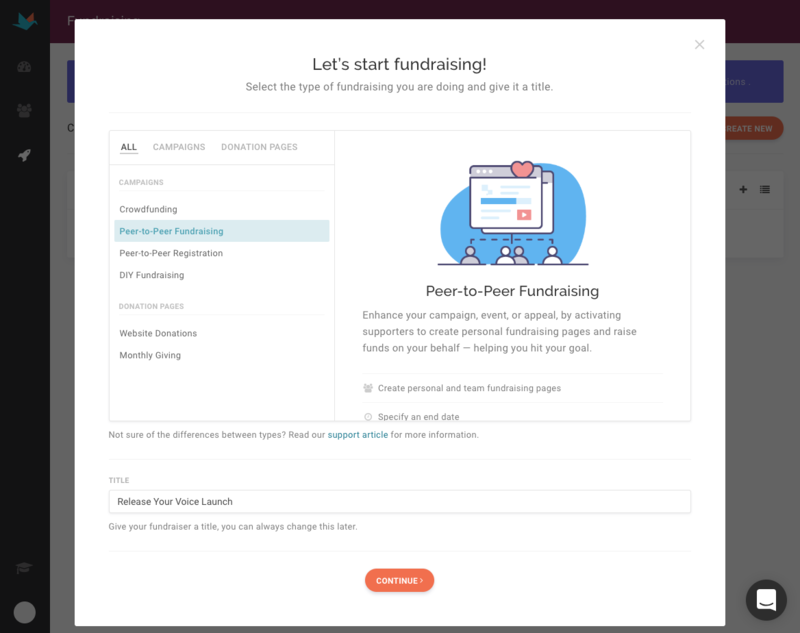 Next, you'll be asked to write your organization name, charity type, website URL (you can use any URL if you don't have a website just yet), and your annual online revenue. Lastly, we'd love to hear why you're setting up your account, so we best know how to help you get started. Step 3: You will be taken to your Dashboard and Insights. 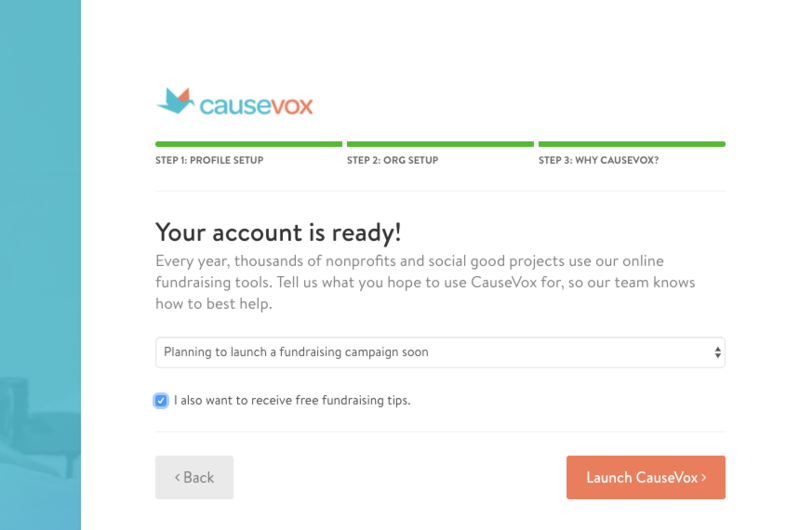 Navigate to your Fundraising (rocket ship icon) and click on the “Create New” button on the top right of the page. Then, fill in a title for your campaign. 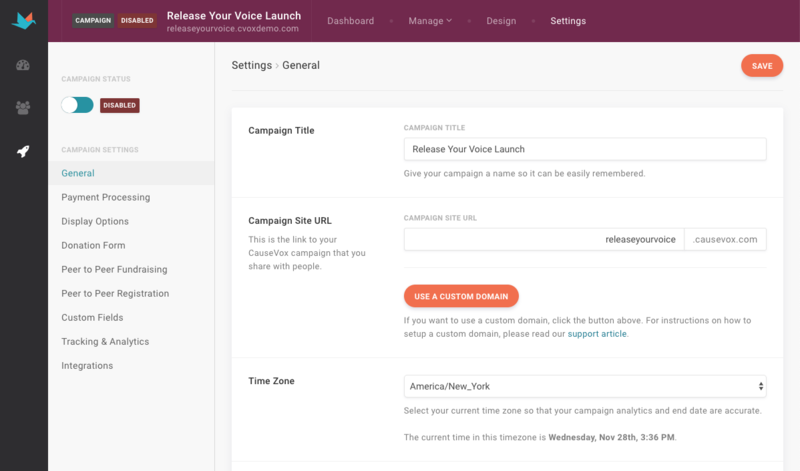 Step 5: General Settings- The campaign site address is automatically populated as the website link for your campaign site. Edit your campaign site address and select your time zone. Scroll down to enter in a fundraising goal (only numbers allowed, no punctuation or symbols allowed), and select and end date. This can always be edited later. For a more detailed description on how to fill out your site settings information, please see our full collection of support articles on Settings. Step 6: Design Site Editor- After you have completed customizing your Site Settings, you're brought to the Design Site Editor. 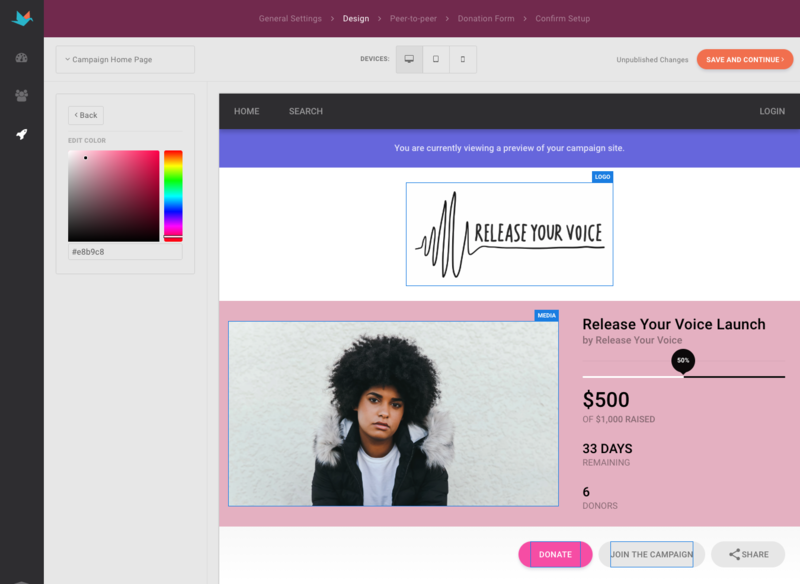 Edit the colors, logo, and media on your campaign site. Scroll down to edit the text on your site. Click on the Save and Button on the upper right menu bar. For a more detailed description on how to use your site editor, please check out our full collection of support articles on the Site Editor. 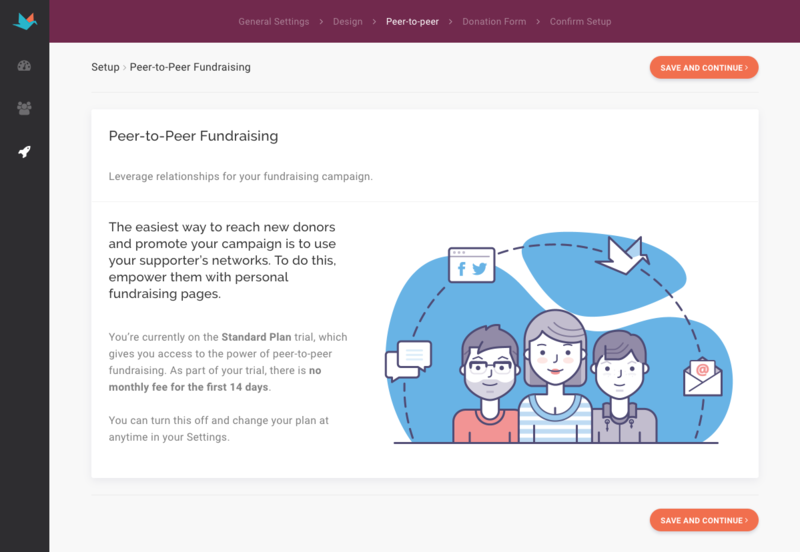 Step 7: Peer-to Peer Fundraising- This gives you more information about peer-to-peer. You can disable this later on in your Settings if you choose not to use it. 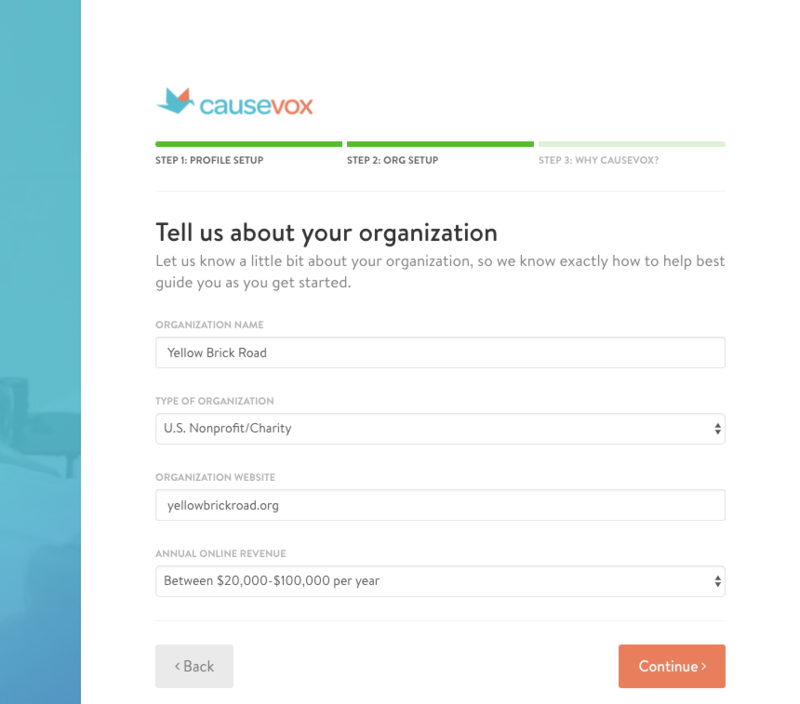 Step 8: Customize Donation Form- Connect your donation processor. You can connect your Stripe account, or select 'learn more info' about how you can connect a PayPal account. You can always come back to this later if you're not quite ready to complete this section. 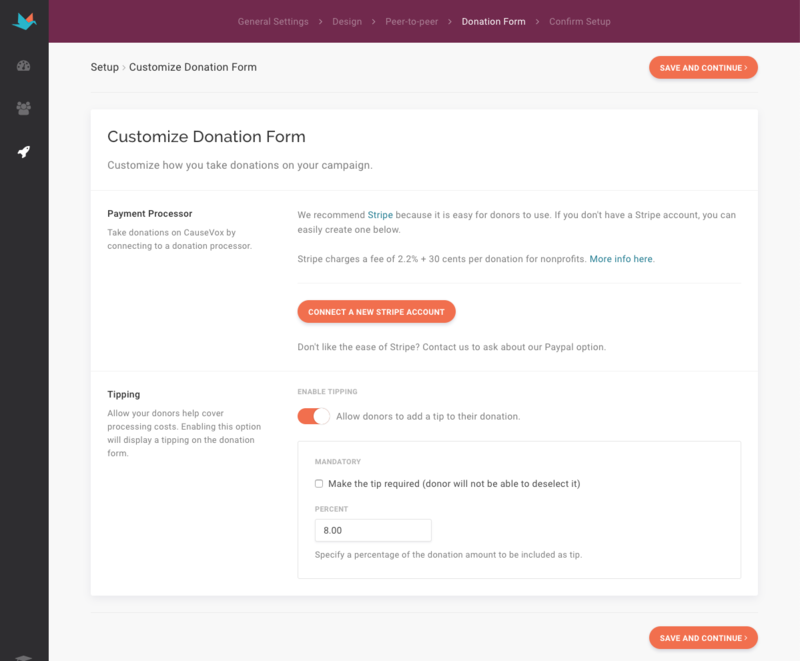 Scroll down to enable or disable donation tipping, which allows donors to cover your transaction fees for you. Step 9: Review your setup progress and make note of any steps you'd like to return to later. 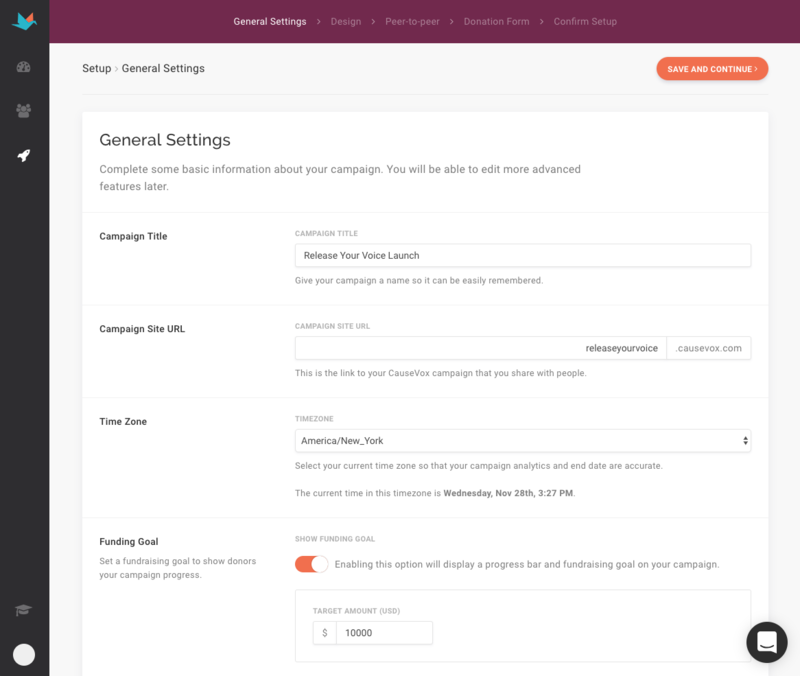 Then, click Exit Setup Wizard to continue to the Dashboard, where you can manage your campaign and navigate to your Design Site Editor or your Settings to make further edits to your campaign. 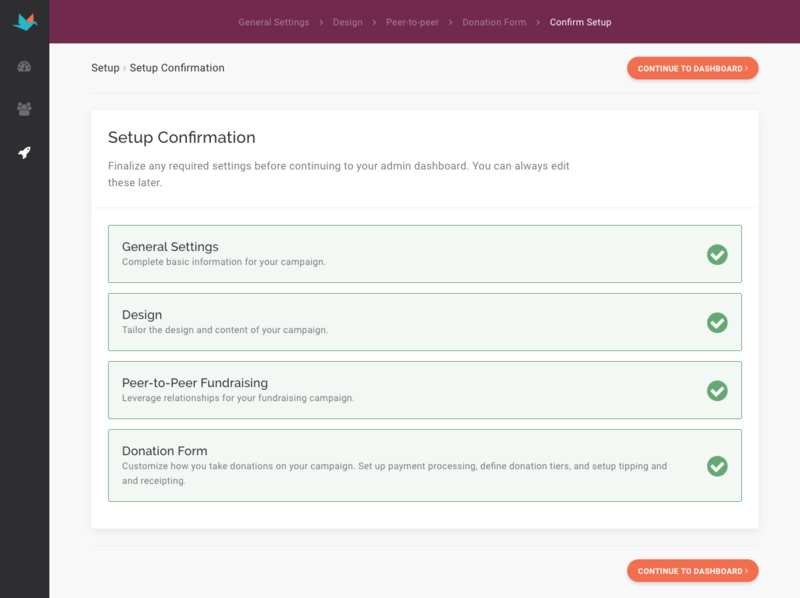 Step 10: Once you are 100% completed with setup, put the site online using the toggle under your Campaign Status. You’re done! 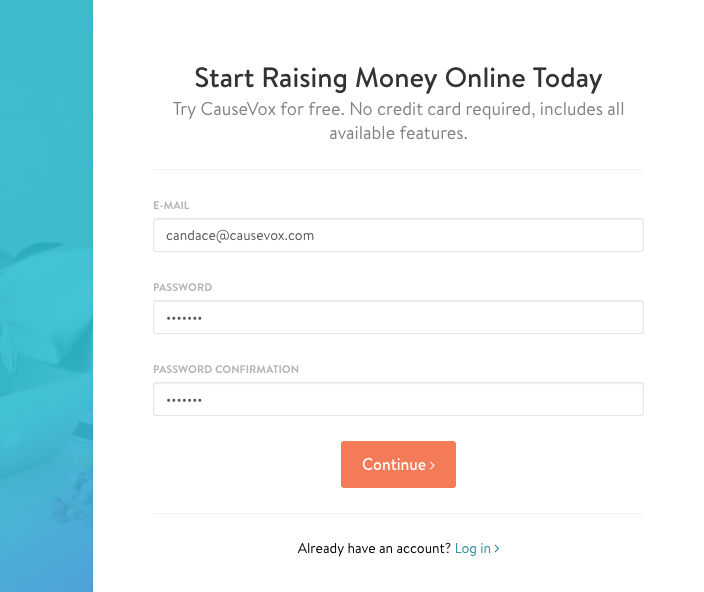 Now you can share your campaign site and start raising funds.